Jernigan Oil Company, Inc., is a full service petroleum products distributor in Ahoskie, North Carolina. We proudly offer quality Shell® and Duck Thru fuels and LP gas to homes, farms, and businesses. Jernigan Oil Company is the parent company of Duck Thru Food Stores, with over 50 locations throughout Southside Virginia and Northeast North Carolina. Jernigan Oil and Duck Thru Food Stores is a family owned business and prides itself in treating customers and staff like members of their own family! Read our history below to find out how this journey started and we hope to see you in our home office or one of our stores soon! “Duck” and his wife Jerri Harrell, worked for Jernigan Oil for more than 20 years prior to becoming owners in 1982. Jerri is the granddaughter of L.S. Jernigan S.R., founder of Jernigan Oil Company. Michael and Billie Joe Harrell are current owners of Jernigan Oil Company. Michael has served as President of Jernigan Oil since 2006 and his wife Billie manages the corporate office and is currently the propane bobtail dispatcher. 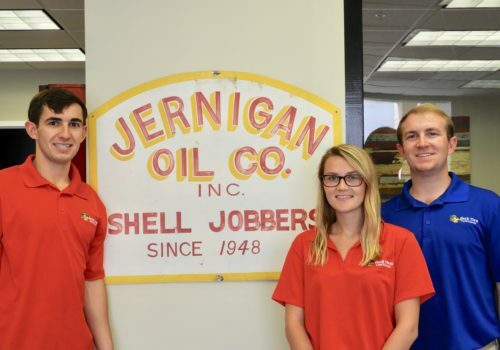 Miles, Jordan, and Mary-joe, sons and daughter of Michael and Billie Joe work for Jernigan Oil and are fifth generation family members to serve positions in the company. In 1983, Duck opened his first convenience store, Duck Thru Food Store #1, located in Murfreesboro North Carolina. In 2006, Michael and wife Billie-joe Harrell acquired Jernigan Oil and Duck Thru Food Stores from “Duck”​ and Jerri. At the time of acquisition, “Duck”​ had built and acquired more than 24 convenience stores, marking Duck Thru as the largest family owned convenience store chain in Eastern North Carolina. Since, Michael has continued to grow the business with more than 50 locations in Southside Virginia and Northeast North Carolina.